Get ready for adventure with excellent outdoor trousers for women! If you are outdoors frequently and are looking for an adventure, should not dare to leave the house without women's outdoor trousers. Outdoor trousers for women should be able to deal with harsh conditions, provide enough space for the legs to move, keep you warm when it is cold and protect you from the weather if necessary. There are suitable outdoor trousers for women for any outdoor activity and any weather. Whether you go trekking touring, bouldering or climbing, outdoor trousers for women will prepare you for anything perfectly. Finding a suitable pair of outdoor trousers for women is really not exactly rocket science. As soon as you know which features your outdoor trousers for women are supposed to provide and for what purpose you need them, you will find them quickly. Active climbers might not want to miss the climbing or bouldering trousers when it comes to outdoor trousers for women. These outdoor trousers for women are particularly tough since they certainly should not suffer damage at the very first rock scratch. The outdoor trousers for women are utterly comfortable to wear since they provide great freedom of movement. After all, the last thing you want outdoor trousers for women to be is that they are constricting and uncomfortable. With these outdoor trousers for women you can climb any mountain with ease. Softshell trousers are the right outdoor trousers for women when it comes to your sweaty work out. These outdoor trousers for women particularly excel due to their excellent breathability. While sweating, the moisture will be transported outside by the fabric where it can evaporate. That way, your skin stays pleasantly dry at all time! In addition to that, the outdoor trousers for women are abrasion-resistant and provide excellent insulation and hence wind protection. You are perfectly prepared for your next rough tour with these trekking trousers for women. If you value excellent weather protection, hardshell trousers for women are your best pick. This type of outdoor trousers for women are perfect rain trousers. These trousers for women will get you through the harshest weather conditions. Even the heaviest rainfall does not stand a chance against these rain trousers for women. Outdoor trousers for women - a real eye-catcher! Of course, when it comes to outdoor trousers for women, the functionality plays most important part. 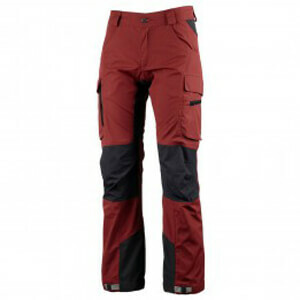 But the outdoor trousers for women's sporty design and the female look will catch anyone's eye even in everyday life. Whether it is in the office, at college or while getting the groceries, fashionable outdoor trousers for women will always leave an impression.